Nail-biting. That's the only way to describe the final few laps of the very last race of the 2018-2019 MRF Challenge season finale. Jamie Chadwick, one of the only two female racers of the pack, is in the lead. Chasing her, and hoping to wrest victory from Chadwick's grasp, is Max Defourny, who in turn is being chased by Patrick Pasma. It seems like the race could go to any one of the three, with the slightest slip-up from Chadwick likely to give Defourny the advantage. And, indeed, whether she finishes first, or anywhere else in the top six, won't make a difference  the title will be hers. But, Chadwick's clearly got victory on her mind. Winning the championship title, with a third race win of the weekend  that's exactly what she wants. And, as things eventually turn out, that's exactly what she gets. It's a historic victory, with Chadwick becoming the series' first woman champion. 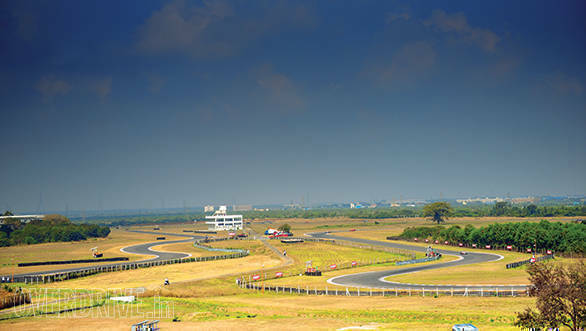 And it all went down at the Madras Motor Race Track. Chadwick's success at the season finale is no surprise. In my short conversation with her, she came across as measured and focussed. Qualities that are as fundamental to a racing driver's skill-set as their actual ability behind the wheel of a racecar. "I started to race by accident really, my family has had no racing background. When my brother started karting, I decided to tag along to see what it was about. It caught my interest and one thing led to another," says Chadwick on how she started racing to begin with. She was around 12 then. Following a year of karting, she moved to touring car racing, starting with the Ginetta Junior Championship, a support series to the British Touring Cars Championship (BTCC). By 2015, she had moved to the upper rungs of this series, racing and winning the title in an Aston Martin Racing V8 Vantage GT4 with Beechdean Motorsport. She made the switch to single seaters in 2017 and has competed in the British F3 championship for the last two years, where she became the first woman to win a race at Brands Hatch last year. Of course, this is just another one of the firsts that she's managed, given that at 20, she became the youngest driver and the first woman to ever win a British GT title. 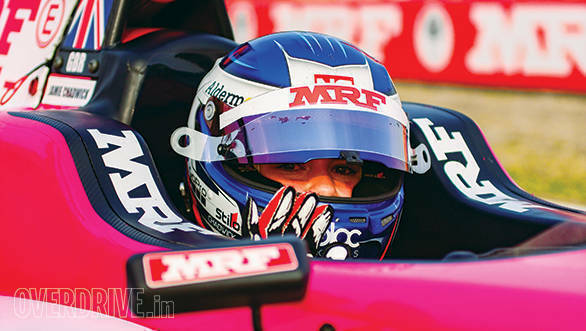 The MRF Challenge title is her first single-seater championship title. Ahead of the all-important season finale though, Chadwick was calm. In fact, she says that keeping calm is one of the best ways to prepare for a race weekend. "For me what works best is a very relaxed build-up to the weekend. It can be difficult though with all the preparation that goes with coming to a new circuit. Work with your engineers, learn about the circuit, the car so that you can go into the first practice with as much knowledge as possible. It's more to do with being focussed and having a clear and empty mind and being completely refreshed," she says. And given that it was her first time out at the MMRT, where she won three of the five races that weekend (finishing fifth in the other two, and scoring one fastest lap), it was clear that her approach worked very well indeed. But what drew Chadwick to a series like the MRF Challenge? Especially given that there's been no dearth of opportunities for her  she's already tested for the NIO Formula E team, her association with Aston Martin is steadily growing, and she's made it to the next round of selection in the all-women W Series. Chadwick says, "The MRF Challenge really helps my racing career. In the west, it's very easy for a racing driver to switch off in the winter months, not do anything between September and March. It's crucial for me because I'm racing, I'm active and it's keeping me race-fit, which is a very different fitness. So hopefully, this keeps me in good shape for the season." 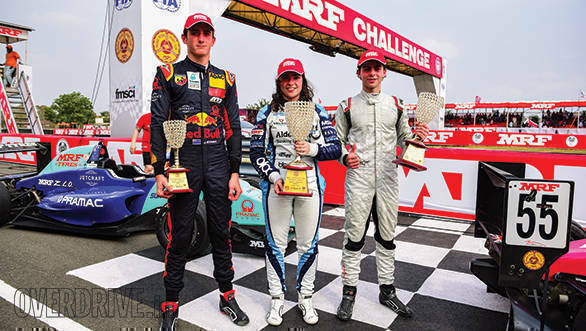 On how the MRF Challenge matches up to other racing series, Chadwick adds, "The MRF Challenge is very competitive. It's quite different because you're not in individual teams. You have your engineer and mechanic but all the cars are the same, this makes it quite different from the championships back home. It's a new challenge for me." Especially given that it's hard to gain an advantage over the other drivers, even though the grid is small, because the cars really are equal. Which means winning races, and winning the title is down to drivers' skill. 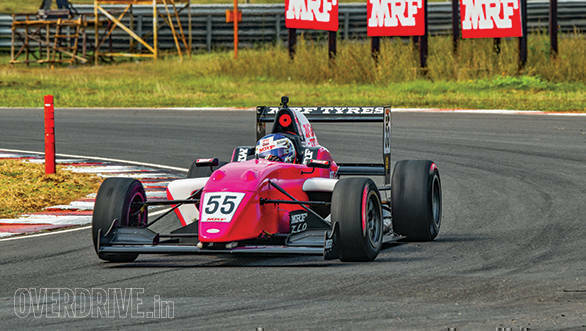 This certainly makes the MRF Challenge one of the most reputed single-seater series in this part of the world. After all, the international weekends (the championship has also run in Bahrain, Dubai) bring a good mix of tracks. 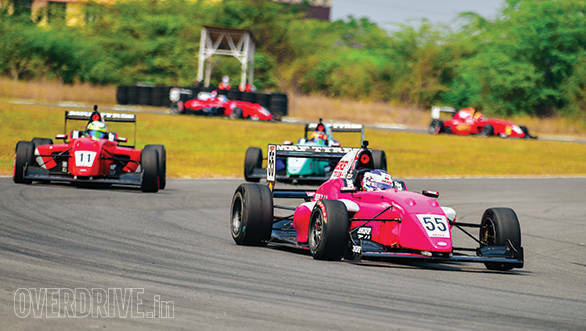 And the JA-developed F2000 cars are quite the package, with their Dallara chassis and the 240PS Mountune Duratec engines. Before Chadwick leaves, I ask her what she thinks of the MMRT. "It's a lot like the circuits we have in the UK. There's a lot less space, a lot more narrow, a bit bumpier. I love it, it's a very different challenge with the high speed corners and technical bits. It's harder work than Bahrain and Dubai," she says. Maybe she's got a soft corner for the circuit, given that it's where she's just won her first single-seater crown, here. We'll allow it!